#Nassau, November 6, 2018 – Bahamas – The Hon. 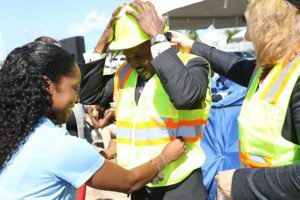 Desmond Bannister, Minister of Public Works, headed a list of officials who participated in a ground breaking ceremony Monday, November 5, 2018 for Palm Cay’s One Marina, a $100-million luxury residential and resort complex on Yamacraw Hill Road, the eastern end of New Providence. ‘One Marina’ overlooks a marina and 84 two- and three-bedroom condominiums and penthouse complex with modern interior designs and high-end finishes. Designed by Winston Jones, architect, the project is planned to be completed by 2020. To date, approximately 107 units have been constructed and 72 lots have been purchased. The brief ceremony, which also featured a tour, was attended by, among others, Diane Holowesko-Dunkley, chairman, Town Planning Committee; Tyrone Sawyer, Senior Director, Ministry of Tourism; students and administrators of St. Andrew’s School. Bob Batchelor, Chief Executive Officer, dubbed One Marina the “most ambitious” project to date. 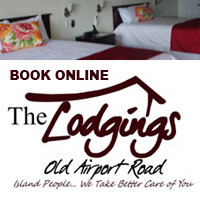 Palm Cay’s offerings include 24 hour security, a fitness centre, half-size Olympic swimming pool, boat tours, bike trail, children’s park, dockside café and beach bar and grill. “Not only are we here to make money for my shareholders, but we want to forge a really good partnership with the community. We’re investing back in the community and our own resort. It’s good to see the kids here. Minister Bannister congratulated the developers and wished them the “very best” in their project. 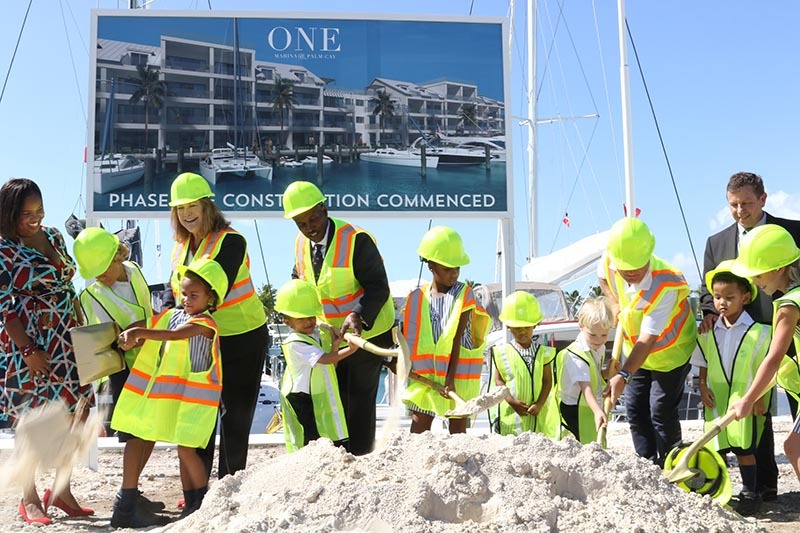 Header: Students of St. Andrew’s School help to turn the soil as ground is broken for Palm Cay’s One Marina. Also shown from left are Tameka Cartwright, Director of Development and Public Relations, St. Andrew’s School; Diane Holowesko Dunkley, chairman, Town Planning Committee; the Hon. Desmond Bannister, Minister of Public Works; Rob Batchelor, Palm Cay and Andy Wood, Principal, St. Andrew’s School. Insert: The Hon. Desmond Bannister, Minister of Public Works, is assisted with putting on his hard hat before participating in the groundbreaking ceremony, as Diane Holowesko Dunkley (right), chairman, Town Planning Committee, looks on. BIS Photos/Raymond A. Bethel, Sr.